I wanted to do something with my life. I changed it all that day. I mean if I spoke you could hear my voice, couldn’t you? To voice unpleasant truths, to stand up for what is right. What does gender have to do with it. I listened to them, I make myself heard. With people I like, people who think like me. His way of life should be yours, some said. He wanted to be lord and master and hence independence disturbed. She had a right to happiness, everyone did. She would stand up for all that is right. Till I give wings to them. 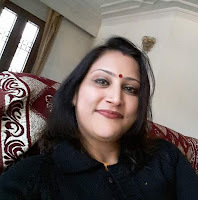 Dr. Nishi Pulugurtha is the Head and Associate Professor in the Department of English, Brahmananda Keshab Chandra College and has taught courses at West Bengal State University and Rabindra Bharati University. Her research areas are British Romantic literature, Postcolonial literature, Indian writing in English, literature of the diaspora and films. She is a creative writer and writes on travel, Alzheimer’s Disease, films, short stories and poetry. Her work has been published in The Statesman, Kolkata, in the anthology Tranquil Muse and online - Café Dissensus, Coldnoon, Queen Mob’s Tea House and Setu. She guest edited the June 2018 Issue of Café Dissensus on Travel.